I love ordering chile rellenos at my local Mexican restaurant – these battered and fried stuffed peppers are just SO delicious. This chile relleno casserole has all of the same flavors but with way less work. Every time I go out for Mexican food, I order a combo plate with a chile relleno on it. Those battered stuffed peppers are one of my favorite foods of all time! This chile relleno casserole has many of the same flavors, but in a convenient baked form that’s fit to feed a crowd. 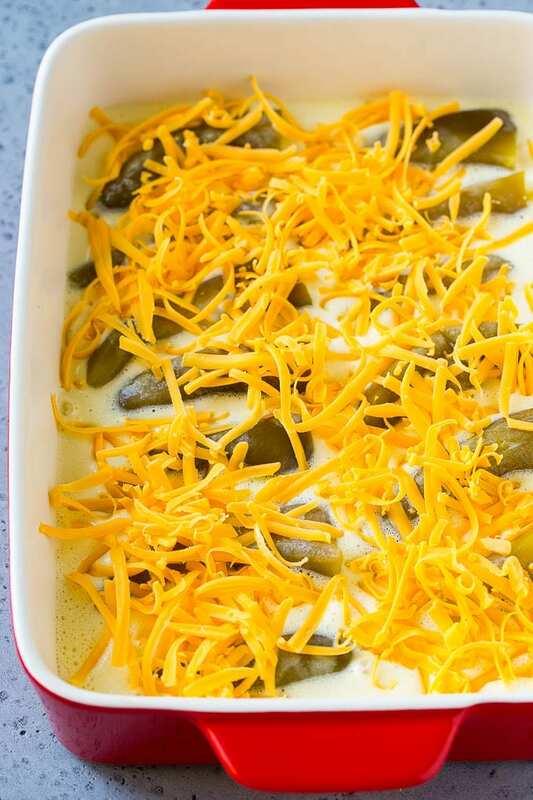 How do you make chile relleno casserole? 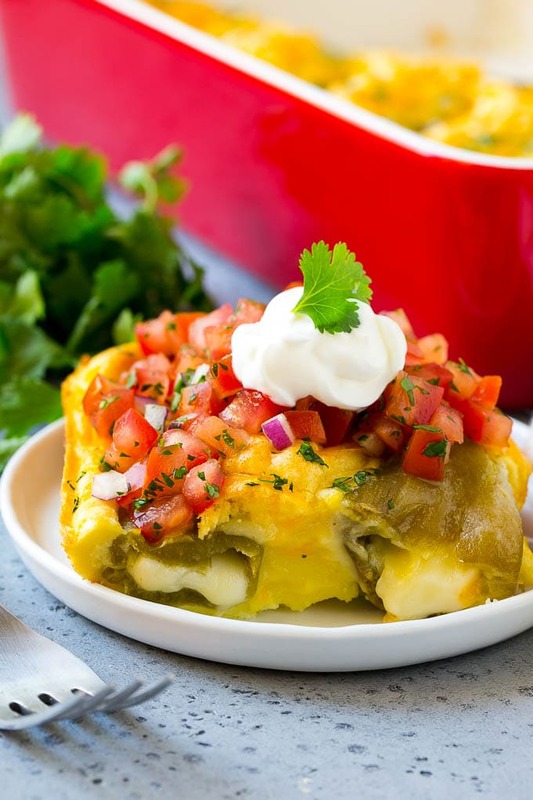 This casserole is made with green chiles which are stuffed with cheese, covered with an egg batter, then baked to perfection. The first step is to stuff each one of your chiles with a stick of cheese. I use Monterey Jack because it’s a mild flavored cheese that melts well. 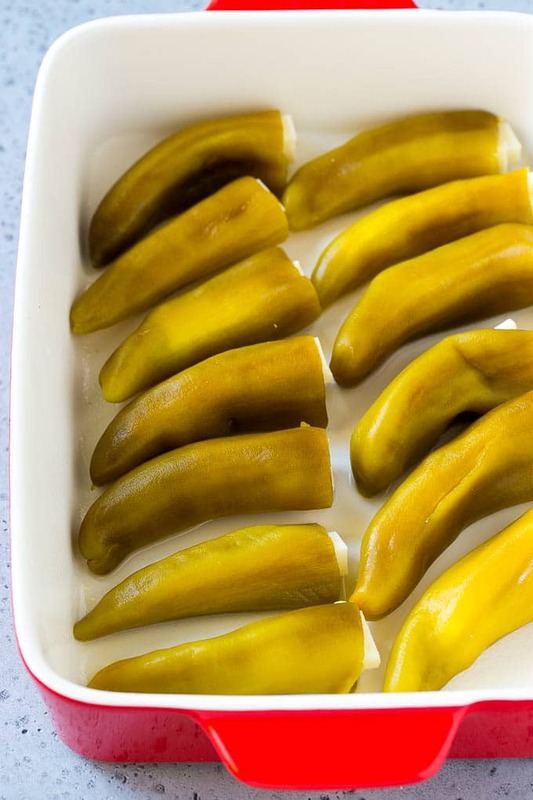 The most commonly used peppers for chile relleno are anaheim peppers and poblano peppers. Anaheim peppers are what is pictured here, and they come conveniently roasted and peeled inside cans in the Mexican section of the grocery store. You can definitely roast your own peppers, but using the canned variety is a lot less work and tastes just as good in my opinion. After your peppers are stuffed, they get covered in an easy egg batter that’s made in minutes with the help of a blender. The final step is a sprinkling of shredded cheddar cheese before the whole casserole goes into the oven. This chile relleno casserole is not spicy. If you’re looking for a spicier version, you could use a spicy cheese in the filling such as habanero or pepper jack, or add some hot sauce to the egg batter. 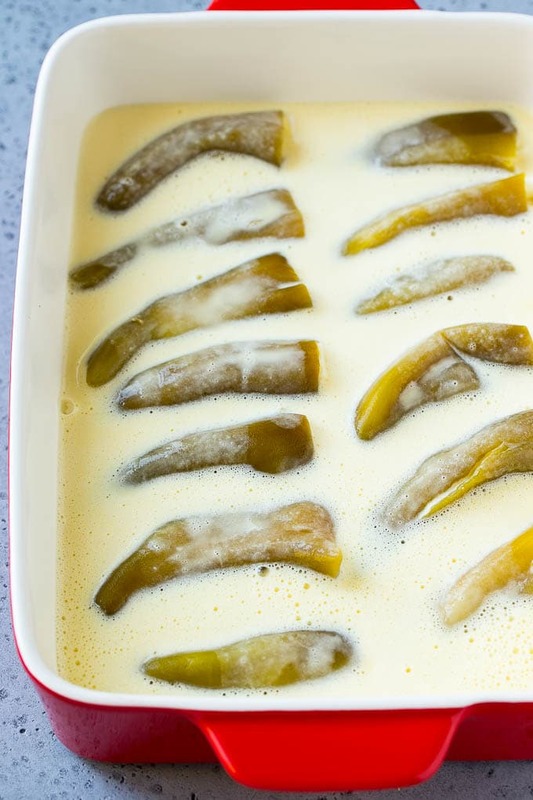 After your chile relleno casserole comes out of the oven, it will be very puffy and browned. As the casserole cools, it will deflate a bit which is totally normal. Add a sprinkling of cilantro and serve as-is, or with some toppings. I always keep cans of green chiles in my pantry so that I can make this recipe whenever the craving strikes. With all the eggs in the batter, this dish even makes a great brunch option! 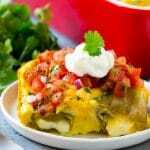 No need to get out the deep fryer for great chile rellenos, this easy casserole is all you need to get those same restaurant style flavors. Place the eggs, milk, flour and baking powder in a blender. Blend until smooth. Pour the egg batter over the chiles and sprinkle the top with cheddar cheese. Bake for 30 minutes or until light golden brown and puffy. Sprinkle with cilantro and serve with additional toppings if desired. Many, MANY years ago, I had this recipe on a hand written piece of paper. I lost it. I have been searching for it ever since, and her it is! This is so easy, and I can’t wait to make it again. Thank you! That’s awesome I hope you enjoy! I love Chille Relleno but have never made it at home. Thank you for the recipe so I can try it! I like chili and cheese together. I’ll most likely copy your recipe and try it out at home. I’ve never made this before, but it looks delicious! I would love to try this sometime. What a lovely dish.The pics are making me want to have it right away.I hope I am able to taste this dish sometime soon. 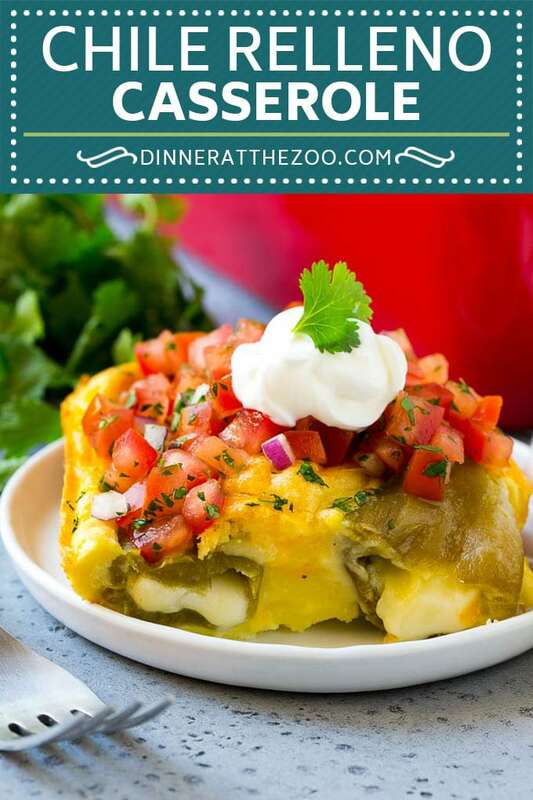 The chile relleno casserole looks so delicious! I don’t like too spicy food but I’m willing to cook this myself. Hopefully I can do it next weekend! 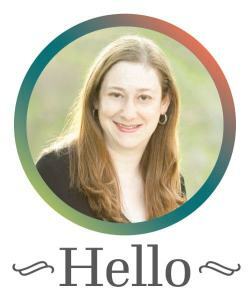 I just sent this link to my husband who loves to cook! I bet I see it on my plate next week! Thank you! DROOL!! 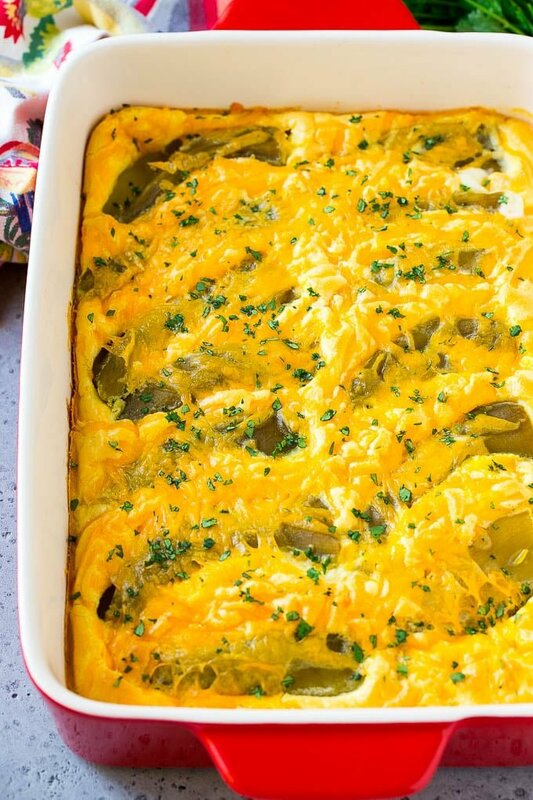 This casserole looks crazy good. I have never even had anything like that before. YUM. I love classic chile rellenos but they can be tedious to make. Your casserole version sounds much easier and just as delicious! I have actually never had chile relleno before, but I am over here drooling at your pics. This definitely looks like something I need to introduce myself to asap! Any time we go to a Mexican restaurant I usually get the chile relleno meal. Such a delicious meal. I look forward to making this soon. My husband would love this. It’s the favorite parts of everything he eats on game day in one delicious casserole. Love it. That looks so good! It’s like a gameday appetizer for a dinner side! I have to make this.